The left photo shows a US made seven pin miniature 6AL5 electron tube. Miniature all glass 7-pin and 9-pin vacuum tubes were used in many different amplifiers - sound, guitar, RF (Radio Frequency) - and for oscillators and mixers. 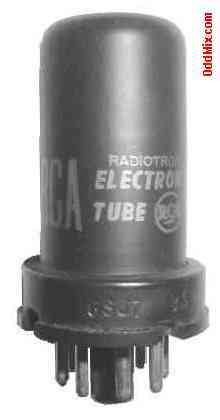 The right image is from an RCA Radiotron 6SJ7 metal jacketed octal vacuum tube. Metal tubes were popular during the second world war. The metal jacket ruggedized the tubes and also provided integral RF shielding. Metal tubes are handy for a great many electronic projects, but they are increasingly difficult to find rare vintage, collector's items. First come first serve, as OddMix has only a few metal tubes available! Many additional tube pictures are also available. They are located within the different tube groups. Almost all NOS tubes (New Old Stock) have it's picture available, check them out. Glass and metal electron tube construction.